Two photojournalists traveled almost 10,000 miles around the Arctic last summer, documenting a new world borne by melting ice. In the late 19th century, Arctic mania gripped the world. Explorers raced to discover the North Pole, and some held that they’d find a paradisiacal lost civilization there–before explorers arrived in 1909 to find a frozen ice cap. Little more than a century later, the Arctic is in the midst of “the most unprecedented transition in human history,” according to the National Oceanic and Atmospheric Administration, spurring another international race to control the top of the world. The rapid loss of ice in the Arctic is transforming life for the people and animals who live there and amplifying rising temperatures all over the world. Indigenous peoples are struggling to maintain their traditional livelihoods. Without ice to protect them from erosion, coastal communities are literally falling into the sea. Countries like Russia, Canada, and the United States are moving to develop their military capabilities to take advantage of the newly opened polar sea–and lay claim to the oil, gas, and mining resources there. 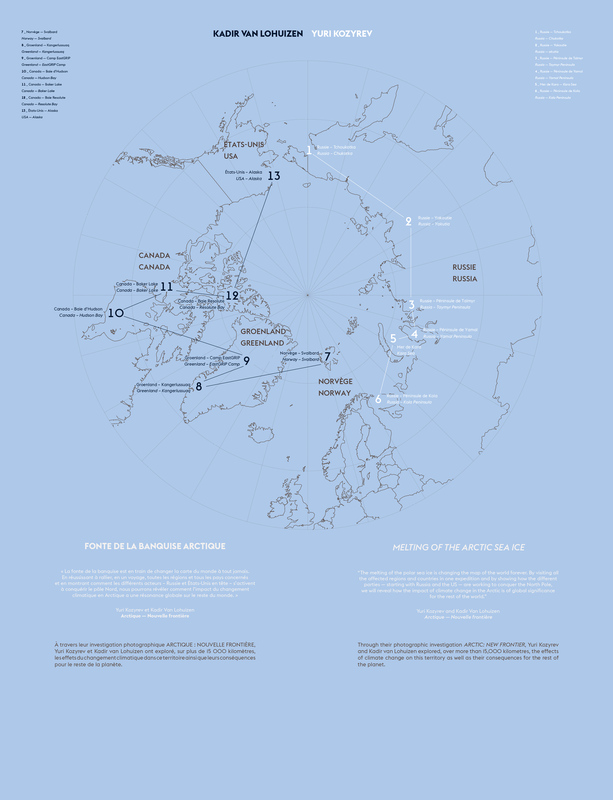 The Arctic is literally a new frontier–which makes it an appropriate title for the ambitious six-month project recently completed by Van Lohuizen and fellow photojournalist Yuri Kozyrev. The duo, who have independently spend decades as photojournalists in conflict zones all over the world, worked together to win a €100,000 grant from the Fondation Carmignac for investigative photography last year. Their goal? Travel almost 10,000 miles around the Arctic–with Russian-born Kozyrev taking the Eastern route and Van Lohuizen going west–to document the new frontier. The results of that journey, a book and exhibition at the Cité des sciences et de l’industrie in Paris, were revealed this week. The Carmignac’s Photojournalism Award has been around for almost a decade, but this was the first time two photographers have ever won the award in a single year. For Kozyrev and Van Lohuizen, it meant planning a long journey through highly regulated and virtually inaccessible sites during the Arctic summer. It took Kozyrev through sprawling mining operations and areas where melting permafrost is uncovering mammoth tusks (and splintered remains of the Gulag). On board a container ship that had completed the first route from Europe to Asia without help from icebreakers, he visited the coastal town of Murmansk, where Russia is building a floating nuclear power plant. The trip him to towns like Kivalina and Barrow, Alaska, where the lack of sea ice is exposing the coastline to extreme erosion: Within less than a decade, Kivalina may be underwater and its residents will be climate refugees. In Siberia, Kozyrev traveled with the indigenous Nenet people, who have migrated seasonally with their reindeer herds for centuries. One photo captures a Nenet family herding their small flock across snowmelt. “For the first time in 2018, because of the melting of the permafrost, they were unable to complete their transhumance,” explains the caption. The photos in Arctic: New Frontier feel like a blast of cold air, a sharp warning and bellwether of what’s to come for the rest of the world. In another few years, the landscapes that Kozyrev and Van Lohuizen documented this summer may be completely transformed–with only photographs like these to remind us of what the Arctic was like before the great melt was complete.